Susan was spayed by the RSPCA at the end of November. She has zero hair regrowth on her tummy, is this usual? Thank you, I have a cat that's spay site only ever got a downy fluzz covering rather than a full fur growth so knew this could happen in cats but thought rabbits would need to regrow asap for warmth. The dewlap is where food is stored I believe. Being a "meat" rabbit she would have been overfed and having lots of babies they would have given her too much food for this as well. That makes me sad, I hope we can eventually give her a home, a husbun and zooming space she deserves. 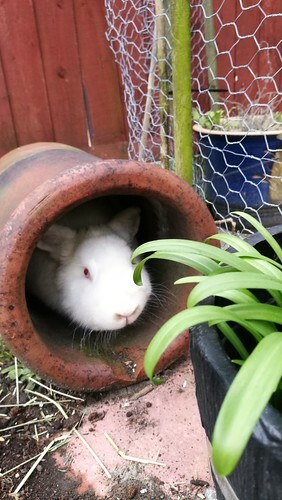 Zoomies through the chimney pot, round the snow drops, over the empty plant pots and into the wendy house.